Transporting Australia wide since 2002. With a fleet of tilt trays, side loaders, low loaders and crane trucks Reef Group can assist with your transport requirements. 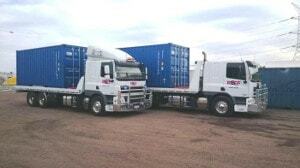 Reef Group has been providing freight transport services throughout Australia since 2002. Our team boasts combined industry experience of more than 40 years, and we operate a fleet of state-of-the-art side loaders, low loaders, tilt trays and Hiab crane trucks. Along those lines, we’ve stepped out as a natural leader in container transport in Perth. We specialise in the shipment of oversized equipment, heavy machinery, access equipment, sea containers, general freight and more. 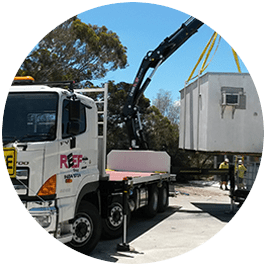 Reef Group is capable of providing transport across the Perth metropolitan area, as well as throughout WA and even interstate via Fremantle Ports or rail. Our clients have options when it comes to choosing a transport company in Perth. They rely on Reef Group because of our industry experience, dependability and our insistence on making use of the latest technology. Take our container loading and offloading system (CLOS) as an example. It was WorkSafe awarded in 2005 and was more recently nominated as a ‘WA Innovator of the Year’. We also insist on fitting all of our trucks with the latest live-tracking equipment. This allows us to tell precisely where your shipment is at any given moment and provide electronic documentation along the way. 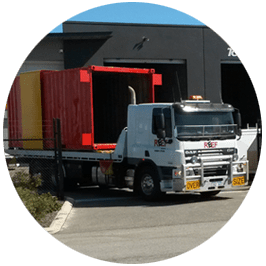 When you arrange Perth container transport with Reef Group, you can rest assured that your freight is in good hands. Contact us today for a quote or for more information. Our tilt trays are capable of loading and offloading equipment at a minimum angle so that your cargo is treated with the utmost care throughout the transport process. They can accommodate 20-foot containers or machinery and equipment weighing up to 10 tonnes. The award-winning loading and offloading system further assists in ensuring delicate handling from start to finish. These heavy-duty vehicles are capable of carrying 20-foot or 40-foot containers as well as containerised generators weighing up to 30 tonnes. A side loader is equipped with crane arms, which are deployed to the right-hand side of the vehicle for the purpose of loading and offloading the cargo. With that in mind, side loader transport in Perth requires clearance on the driver’s side during the loading phase. 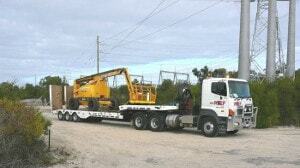 Also known as a ‘drop deck’, a tri-axle low loader is capable of carrying up to 24 tonnes of machinery and equipment. Low loader transport in Perth features a two-tiered deck. The top deck is 4 metres long, while the bottom deck is 9.5 metres long. We also carry twist locks and stanchions, which allow us to transport 20-foot and 40-foot sea containers on our low loaders as well. Our hydraulic truck mounted crane is a highly versatile piece of equipment, and it allows us to lift heavy machinery over fences, move cargo past obstacles and deliver to second and third floor locations. 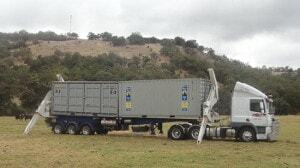 It also comes with an optional pig trailer that is able to deliver multiple loads. Our crane operator is highly qualified – holding both EWP and forklift tickets – and he’s licensed to operate any mobile slewing crane of up to 100 tonnes. 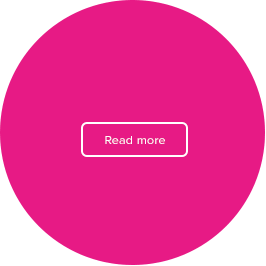 You can download our ‘Transport Guide’ for more information regarding which vehicle is best suited to the job you have in mind. And if you require clarification, please don’t hesitate to contact us by calling 08 9454 3724. Safety is a top priority at Reef Group. 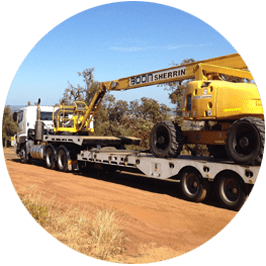 Our vehicles are WA Heavy Vehicle Accredited (Main Roads WA), and all of our drivers are highly qualified for the work they perform. We insist that licensure, elevated work platform certifications (EWPs), first-aid training, MSIC cards, white cards and medical check-ups are all up to date. We also tend to fatigue management and other factors that affect the health and wellbeing of our drivers. If a specific vehicle in our fleet requires any special expertise, we’re there to ensure that everything is in order. For example, our Hiab crane operator is licensed to handle a mobile slewing crane that can lift up to 100 tonnes. Of course, he also holds his forklift ticket and EWP. 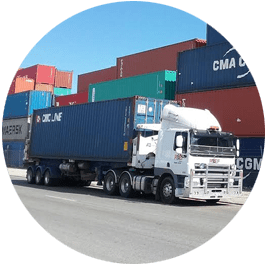 As your business grows and begins to branch out into new markets across Australia and the world, you’ll need scalable transport solutions in order to keep up. Container transport in Perth is an important part of this equation. Contact Reef Group today to learn more. 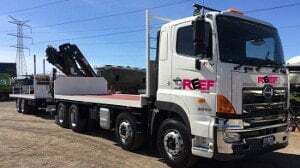 Reef Group’s truck unloading a 20ft sea container. Find more videos on our Youtube page.